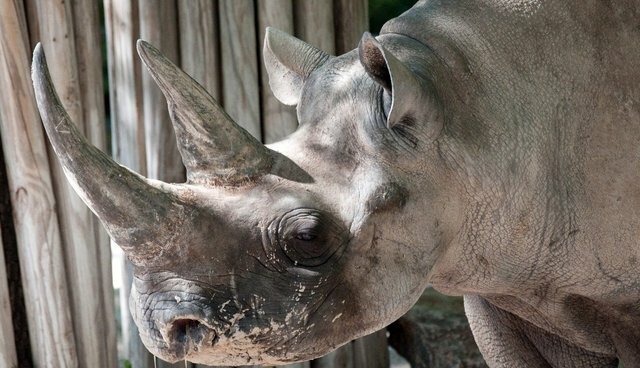 Wealthy Asian businessmen, airport seizures of horn and ivory, silent apathy from politicians, ongoing heated trade debates... a ferocious circle surrounding and depleting our rhinos and elephants. Yet, at the center of it all, on the blood soaked savanna stand the rangers. The monument outside of KWS headquarters honors the fallen rangers. Photo: KWS Under the blazing sun or in pouring rain, no weekends or holidays, for little pay and high stakes-they are the only real obstacle standing between the poachers and the rhinos. 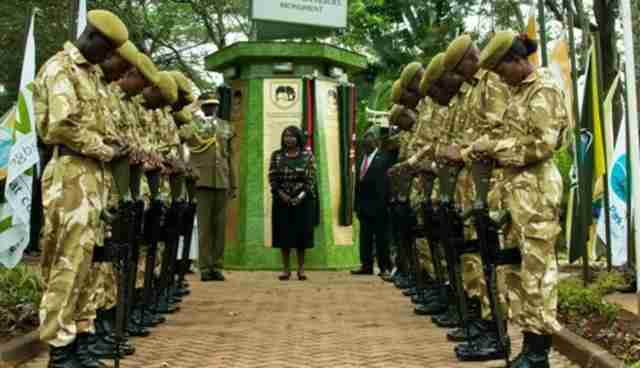 A recent report from the Kenyan government sited "low morale" as being a huge problem in the bush for the Kenyan Wildlife Service rangers. "Well its early up....after breakfast of only food in tins we start patrolling to see if we can't find tracks of animals or poachers.....after we find tracks we follow.....till we get what we want. Sometimes we have to walk hours and lots of km a day to see the Rhinos or any other wildlife. We get to camp at dark and still have to make food, after that we get a few hours of sleep. Then comes night patrol. 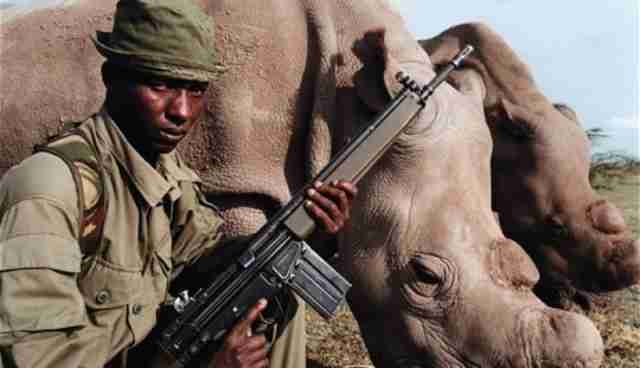 We have poachers coming at night to shoot the animals so we have to be alert at all times. We get so tired but we help each other to stay awake. This goes on for 10 to 15 days in one area then we move again to the next." "We help lodges and farmers that breed wild animals and try to protect them. We have no routine, we go as we think its time or on request of the owners. We also work on the highways; that we do with police or the army. We help with road blocks and patrol with them helping with tracking and so on. We are about 30 guys depending on how much money we can get (as I pay them for their families, and for their supplies). Sometimes its only 6 guys." "We get donations from people and the places where we work also help us with food for the periods." Q: It seems you must have a lot to take with you-the essentials for camping equip and food, weapons, etc? "The weapons are our own, the tents we buy from china shops here. They are cheap but not strong so we have to change them out about every second month or so. We take nothing from nature ....no hunting or fishing for food....we take all with us when we go." "Yes. 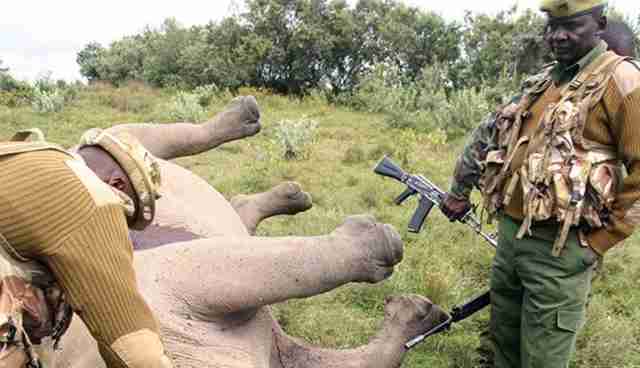 We have a lot of run- ins with poachers....its easy to meet them when you live with them in the bush." Q: What's the most dangerous situation you've been in? "Well in 2005 one of our unit members was killed in a shoot out, but we caught them after 2 days of tracking. We were on highway patrol when we came upon the poachers. They started shooting at us as they tried to drive off....luckily none of us got shot THAT night too." Q: What's the most rewarding situation you've had? "One area in Namibia had a poaching problem for about 3 years...they heard of us and asked for help. We went in with about 12 members. We caught the poachers; they were police and nature conservation members along with the tribe king's son. That was my best bust ever.....just their faces said it all." "Funds to get better equipment....this will make any job better and easy to do. We would like to go on horse back doing bush patrols and when we move from one area to another we would like to have some type of transport to help with the load. It's nice working by foot but it can drain your body very quickly." "Yes it's not easy on our lives if you have a wife and kids, but my wife understands and she is also into nature. You will never get used to it -being away from home. It's very hard work..meaning the sun is really hot here, and animals don't stay in one place, you have to follow them to make sure they are safe so its long distance walking. And at the same time you have to be alert for danger like wild animals, snakes and poachers. It's not easy but I think it's the best job in the world."